First, let me apologize. I wrote up a note on Sunday night while we were at the Boswinger Hostel. A couple of sentences short of finishing, the 'Change Batteries' warning light came on. I tried to finish up instead of changing the batteries immediately, and lost everything I'd typed. I'll try to recreate it later, but trust me; it was inspired prose! So. Monday's ride. I'm not sure if there was a theme to Monday's ride. There was beautiful countryside. More lanes. A few problems with navigation. More tough hills. Some glorious seaside riding. A couple of ferries. And a mad dash through the streets of Plymouth. Leaving the hostel at Boswinger, it was more of the same. Lanes. Verdant green fields. Cows. Sheep. Then a wicked steep downhill dropped us into our first little beach community of the day. 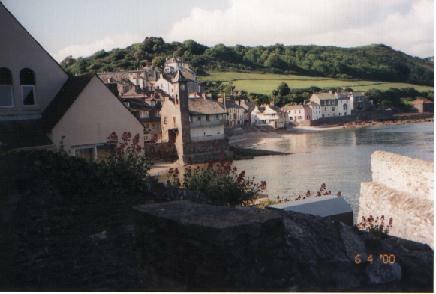 A small beach surrounded by cliffs, with a couple dozen brightly painted stone houses clustered at the head of the beach. The morning continued like this, climbing steeply out of one town, over the headland and dropping steeply into the next. Finally, we hit the town of Looe in midafternoon, and stopped for fish & chips at a takeaway shop along a tourist strip down by the water. I also just had to use the loo in Looe! Our group had by now splintered into several smaller groups taking different routes to Plymouth. Duane and I chose to stay as close to the shore as possible, and it was great. Some tough climbs, but well worth the effort. We finally emerged along the coast across the river from Plymouth. 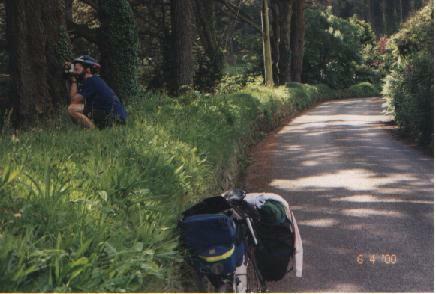 We were rewarded with gently rolling roads and a tailwind that pushed us up the coast. After our second shot at getting a ferry across into town (the first ferry we tried doesn't run until the summer), we were finally in Plymouth. Now the real fun begins. We thought we knew where we were going, but got quite turned around in a roundabout and ended up taking the wrong exit. We spotted a young lady on the pavement (sidewalk to you blokes from the States), wearing her work uniform and out looking for the odd job. We asked her for directions, but quickly got lost in a myriad of twists and curves. Just then, we hear a call of 'Hey! ', and look up to see a man and his two sons who had been on the same ferry as us. They had parked their car on this street and were just getting back. He lives a couple blocks from the guesthouse we're heading for, so he decided to lead us there. Now try to picture Duane and I, riding our bikes laden with panniers carrying all our worldly goods suitable for a three-week trip in a foreign country, sprinting after a car through the streets of Plymouth. Uphill and down. Through roundabouts. Till we finally come to a stop in front of his house. From here his two sons volunteered to lead along some pedestrian paths over the major 'A' road through town and to our destination. Two more eager guides one will never find! It was a chore just keeping up with them. After thanking them and solemnly shaking hands all 'round, they were off back home for their dinner and to talk about the two Yanks on bicycles they had met today. I'm writing this on Tuesday morning, and it's nearly time to go downstairs for breakfast. That's all for now.